Best graphics in the series. Same Halo gameplay with a few nice upgrades. Lots of customization for your Spartan. Spartan Ops adds a lot of co-op replay value. Halo Waypoint integration can be annoying. Multiplayer interface not quite as slick as Reach. Suffers from large frame rate drops in some games. Having taken over the reigns of the Halo franchise, 343 Industries' all-new Halo game is an amazing addition to the series. I do not like Halo. I keep telling myself this as, yet again, I find myself booting up Halo 4 instead of feeding my old Call of Duty addiction. And it's true, or at least it was, up until Halo: Reach...I abhorred the Halo franchise! Bland characters, boring and slow-paced gameplay, bunny hopping, an uninspired story, I just didn't see what all the hype was about. Halo: Reach was the first time I played a game from the series and thought "wow, this is something special, so when I gasped in horror as Bungie handed over the reigns of the wildly popular Halo franchise to a company I had never heard of and then saw that their first game was a remake of the original Halo I, like many people, assumed that Halo was going under. Against my better judgement I pre-ordered Halo 4 and awaited the train wreck that was surely to come, but instead what I got was fantastic game with a wealth of cool features and a story that actually intrigued me. So without further ado, I give you the new Halo. Halo 4 picks up right where Halo 3 left off, without spoiling too much I'll just say that you've been drifting through space for a few years in cryosleep and are woken up by your AI, Cortana, as trouble is on the horizon. What follows is 8 solid missions of alien fighting, humanity saving action where for once the Master Chief isn't the main focus. This story is all about Cortana and the relationship between "she" (or it) and Master Chief. The presentation is excellent, short cinematic moments and a plethora of twists and turns make you actually want to go through the game and figure out what happens next. You meet new bad guys along the way as well as a few new toys and it all culminates in an epic showdown to save mankind...again. 343 Industries made a few bold changes to the game that I think went over pretty well but may unnerve purists. The old Covenant enemies got a complete graphical overhaul, looking drastically different than they have in every other Halo game. Overall the campaign is great and takes you to a wide variety of locations from lush jungles to vast deserts to giant space ships, I beat the campaign on the hardest difficulty by myself and it took maybe 10 hours, but that includes a lot of dying. On the easier difficulties it may take 5-7 hours, I'm unsure though. As with other Halo games you can undertake the campaign in co-op with up to three friends and it is just as fun and satisfying as before. 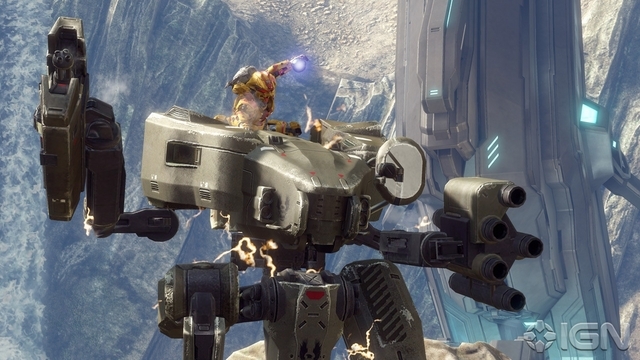 On top of the main campaign 343i introduces a new mini-campaign series called Spartan Ops. Spartan Ops is a constantly updated series of missions that, while nothing particularly special, add an extra level of co-op fun. Each week (so far at least) 343i adds a new episode which contains 5 missions. You can play them in any order and they play out just as campaign missions do. The goals are usually pretty straight forward and the environments are taken straight from the main campaign levels as well as the multiplayer maps. The missions are fun but unless you're grinding for in-game experience to rank up your character don't expect to play most of the missions more than once. Also, in some of the more heavily enemy-populated areas I've experienced massive lag and frame rate drops, I don't know if this is something that can be patched or not but it is more than just a little annoying. Multiplayer is now called War Games, a simulated Spartan vs Spartan training ground where you face off against the best that the internet can throw at you. Game modes are well varied and range from your standard Slayer (Team Deathmatch) to Capture the Flag and Flood (survival). Upon starting War Games you get to create and customize your character. Pick your colors, your emblem, and even different pieces of armor to make your Spartan your own. As you play War Games and Spartan Ops you earn experience which ranks your character up giving you access to new emblems, armor pieces, and equipment. On top of that Halo now adopts a Call of Duty-esque loadout system. You default with two loadout slots and as you play you gain access to up to five. From here you can choose your main and secondary weapon, grenade types, armor powers, as well as two "packages" that give you minor perks (carry more ammo, make grenades more deadly, use your armor powers more often, etc). While you technically have to rank up to unlock it all I never felt outgunned because I didn't have a weapon. Most of the standard weapons are unlocked very quickly and the more specialized items come without too much effort. The system works well and once again takes that extra step in allowing you to tailor the game to your play style. On top of that once you reach rank 50 you unlock Specializations, sub-classes that make your character even more unique. There are eight specializations and each has a unique set of armor and small perks such as faster assassination kills, quicker recharging of vehicle shields, and even extra XP for your games. Finally, one new addition that they've added in-game are Ordinance Drops. As you score points by capturing objectives and killing enemies you are rewarded with a killstreak drop of a weapon or perk. You get your choice of three items (usually one grenade, one weapon, or one powerup although there is specialization that allows you to choose again) and within a second the item drops in front of you. Unfortunately for me it never seems to be the item I'm looking for (usually a sniper rifle when I need a vehicle-destroying weapon and a vehicle destroying weapon when I need a sniper rifle) but it adds a great bit of fun. Overall Multiplayer is excellent, lobbies work pretty well and it usually doesn't take terribly long to get a game going. 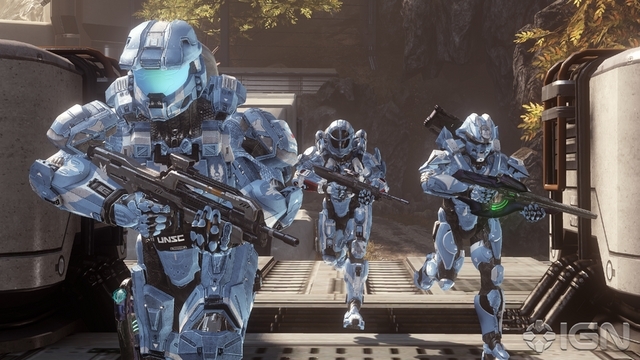 Halo 4 is the first Halo game that will allow others to join your matches in-progress. Are you playing 4v4 and two of your teammates left? No problem, give it a few seconds and most likely you'll have two more join to balance things out. It can be annoying to join a game in-progress but usually the scores are at least close. Going back and forth between this game and Black Ops 2 it is amazing how stable Halo runs, I've played both a good bit and while I am constantly frustrated by the lag in CoD, I never see it in Halo. It is very stable and other than some anomalies trying to get a Big Team Slayer match started I have experienced no issues at all in multiplayer. There is limitless replay value here (as is true with most great multiplayer games) and while I think the overall level of polish on Halo: Reach to be a tad bit better, there is also a lot more to do in Halo 4. The overall experience is excellent. If you had a great game or a moment you didn't want to forget you can save the entire clip of your game and edit it in theater mode which allows you to upload clips and pictures to Waypoint and share them in your profile. The final thing I'll point out is Halo: Waypoint integration. 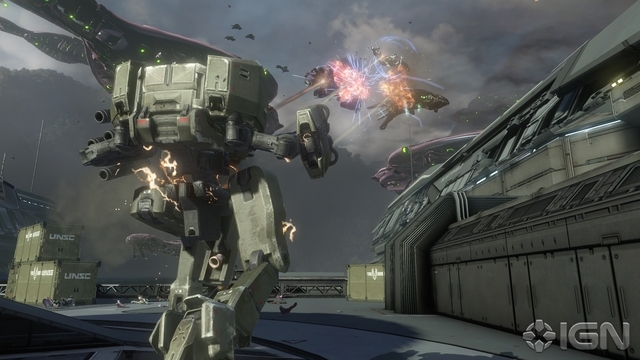 Waypoint is Microsoft's product that lets you view your Halo career. Here you can track your stats, view your video clips, and watch video clips and whatnot. Bungie's stat tracking and file browsing system was MUCH better and easier to use, I can honestly say that I have no clue how to view my screenshots online. The system is extremely slow and cumbersome. Thankfully this is all just extra, you can play the game and never even touch Waypoint but it is there and they're really pushing for integration. On the technical side Halo has never looked better. Characters and environments look sharp, the level of detail has definitely been increased over Halo 3 and Reach with almost no hit to framerate (save for the anomaly in Spartan Ops). Sounds are also quite good although purists will again be sad that they've changed the firing sounds for many of the weapons. 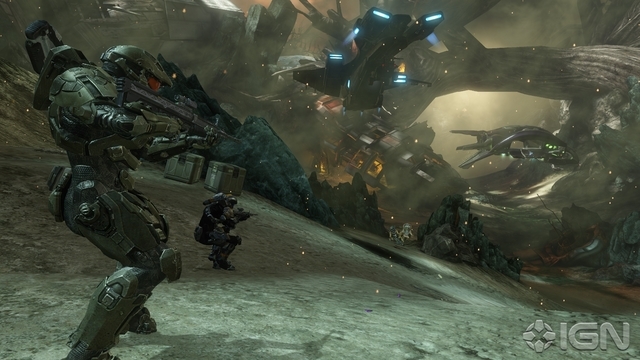 Overall Halo 4 is a fantastic successor to Bungie's epic franchise. The worst part of the game is their release schedule (exactly one week before Black Ops 2 which I'm sure hurt sales) but the final product is nothing short of excellent. If you held off on getting the game due to worrying about the new developers then fear not, 343i has done a fantastic job with the game has impressed me with their humble acknowledgement of Bungie's work and their thanks to the fans for trusting them with the franchise (in the end credits). Unfortunately now I must wait to see what happens in Halo 4, but at least I've got a great game to play while I wait!